Fresh Ghost peppers from our Greenhouse all year ! Assorted colors mainly the classic red, with a few chocolare brown, citrus yellow and peach color. 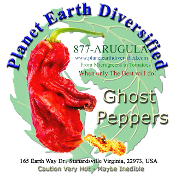 One of the world's hottest peppers - we think they have the best flavor. We also grow scorpions and reepers - but the Bhut Jolokia "Ghost Pepper" is our favorite. Sampler pack in a half pint berry box. Also available in pint and quart containers.